As part of our Signature Collection, we knew that we could only use the best of British fabrics. Known for providing superior materials since 1915, the Empire Mills of Yorkshire is known for specialising in providing fabrics mainly used for men's suits and jackets. Woven from 100% Merino wool, this single breasted jacket drapes well with a soft texture, designed to be strong and versatile – much like your style. Featuring a two-button fastening with natural Corozo buttons, a single centre back vent and a notch lapel. We've also added traditional elements; functional cuffs and a half-canvas chest construction which offers superior shape retention and a natural lapel roll. This piece offers the epitome of classic British styling. Proudly fashioned from fabrics produced here in Britain, the Empire Mills in Yorkshire has supplied premium fabrics – especially for men's suits and jackets – since 1915. Woven from 100% Merino wool, our Signature plain front trousers with turned up cuffs feature a waistband with technical material to help retain your shirt in place throughout the day. Plus, we've added button-through back pockets for that little something extra. Superiorly British. 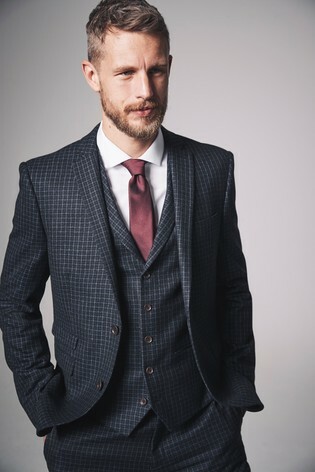 Proudly fashioned from fabrics produced here in Britain, the Empire Mills in Yorkshire has supplied premium fabrics – especially for men's suits and jackets – since 1915. Woven from 100% Merino wool, our Signature waistcoat with a notch lapel features a five-button fastening with Corozo nut buttons and an adjustable back. Style this piece to complement your attire to the next level of English gentleman sophistication. Main 100% Wool. Inner Lining 100% Polyester. Outer Lining 55% Polyester, 45% Viscose.